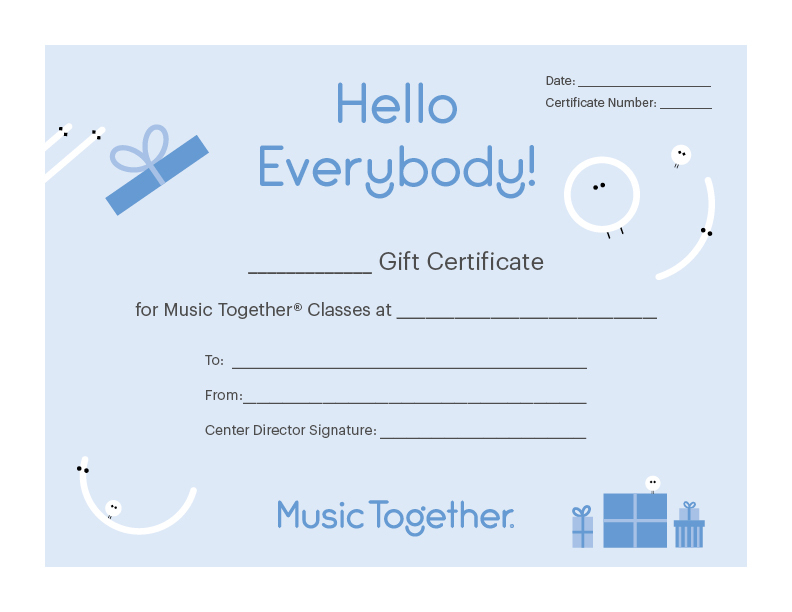 MUSIC TOGETHER® with MUSIC AND ME (we updated our name from Mommy, Music & Me, inc.) offers Gift Certificates in many amounts to cover all or part of the tuition for one of our fun-filled family Music Together classes in Queens. These gift certificates are ideal gifts for grandparents, friends and relatives to give to the children they love for holiday gifts, birthday gifts, or anytime gifts. This gift of music also makes a unique baby shower gift and fills the heart's of every blessed New Family of Music Makers. Gift Certificates are valid for 1 year from date of purchase. MUSIC TOGETHER® with MUSIC AND ME will mail the Gift Certificate to you or directly to the person you are giving it to. When your order is complete, please click Contact Us. In the comments field, let us know what name the Gift Certificate was purchased under, the name of the person TO WHOM the Gift Certificate is going, who the gift is FROM, and the address where you want the gift certificate mailed. You may always leave us a message at 718.229.0033 and we will get back to you within 24 hrs. or sooner.